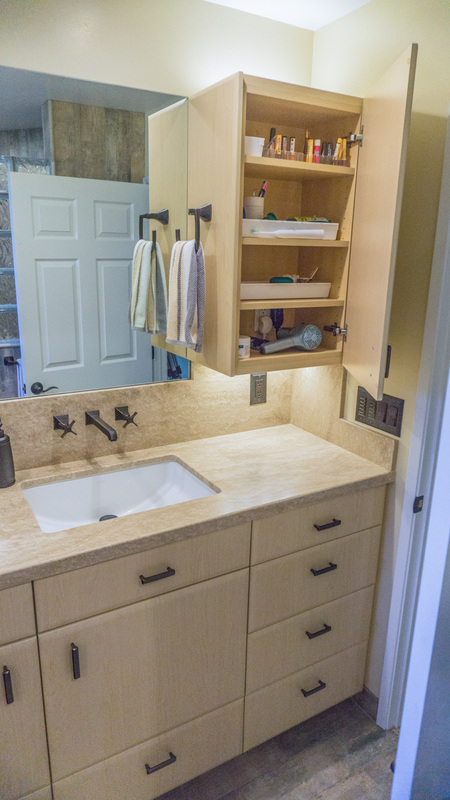 These Are Functional Bath Cabinets with Outlets Inside the Wall Cabinets next to Each Sink and this Client Insisted the Counter Height Be 39″ (Also a Functional Bath Feature) Numerous Drawers Make the Cabinets Easy Access. 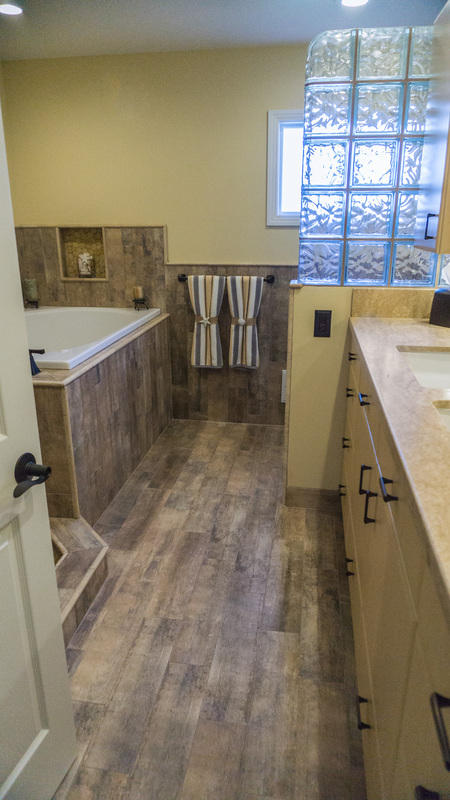 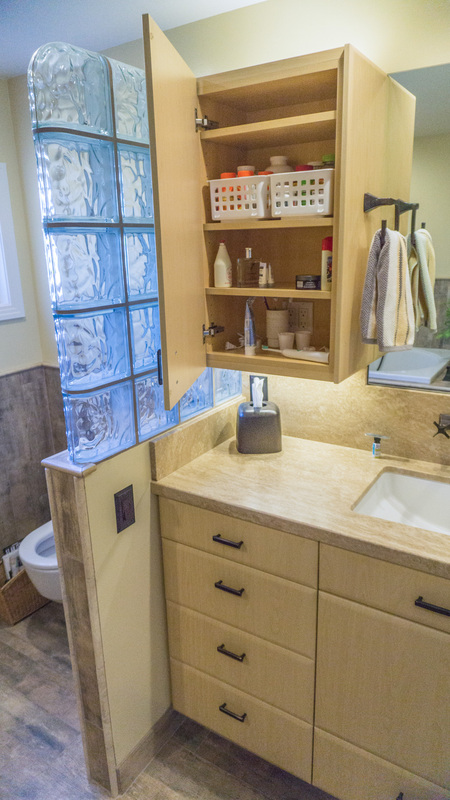 This master bath originally had a typical builder’s tub and small shower. 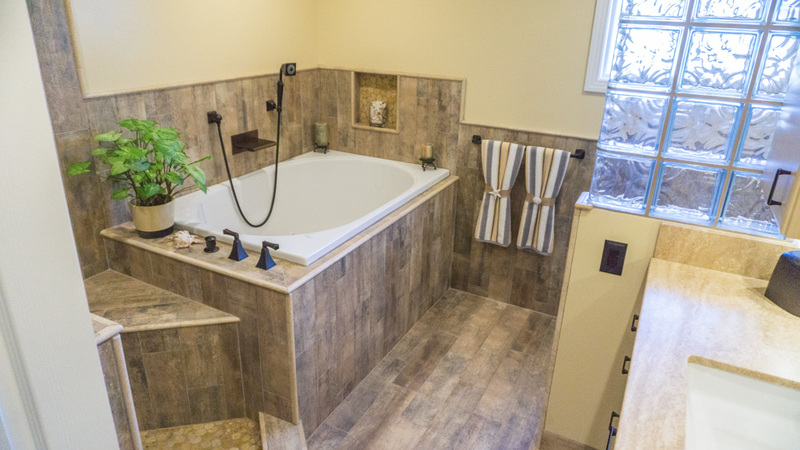 The purpose of the remodel was to open up the bath into a more comfortable space with a large shower and soaking tub. 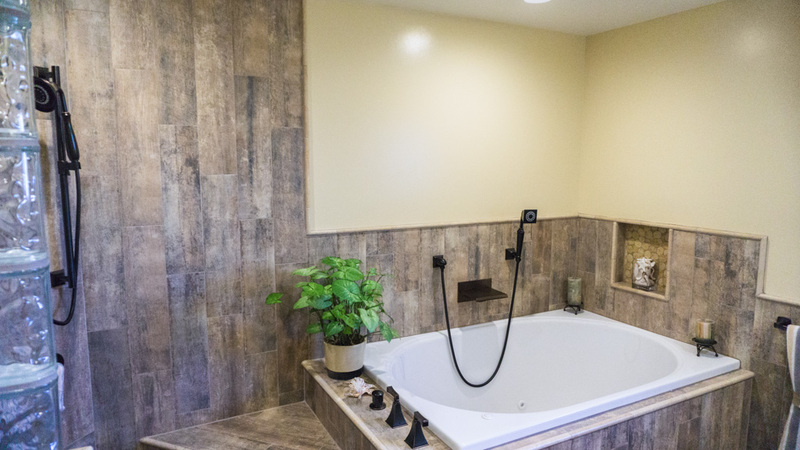 The client had seen this tub across the street in a project I did for their neighbor a few years before. 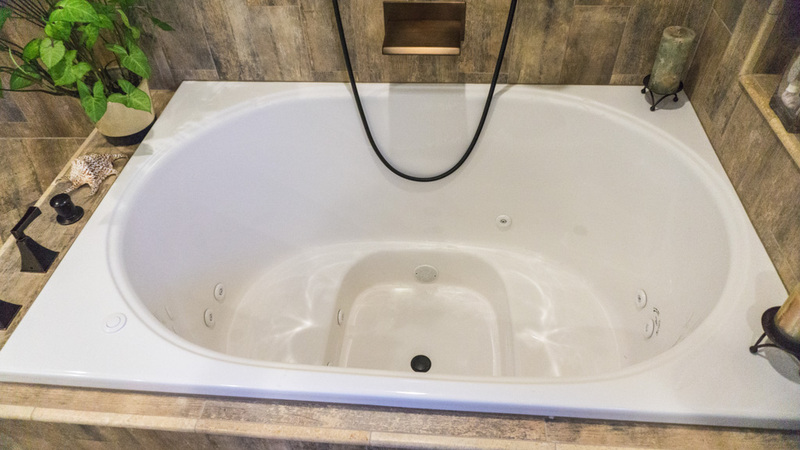 It is an extremely comfortable tub that I have used many times in projects. 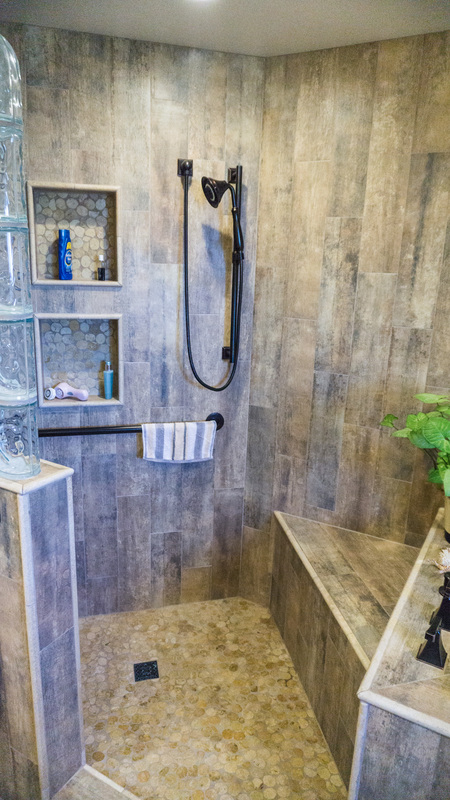 In moving a bearing wall 3 feet, we made the bathroom large enough for all the additions to this extremely functional master bath. 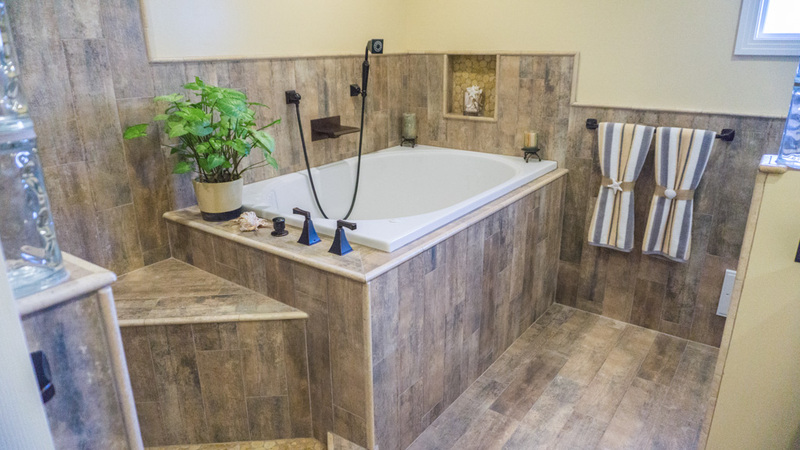 All my functional bath points were captured. 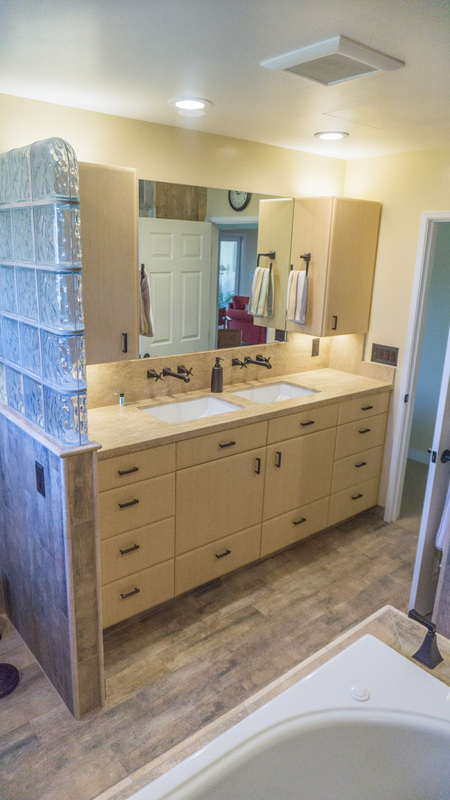 Easy access storage on each side of each sink with outlets inside the cabinets so when personal care implements are in use the door remains open, when done the doors are simply closed and the area stays clean and clutter free. 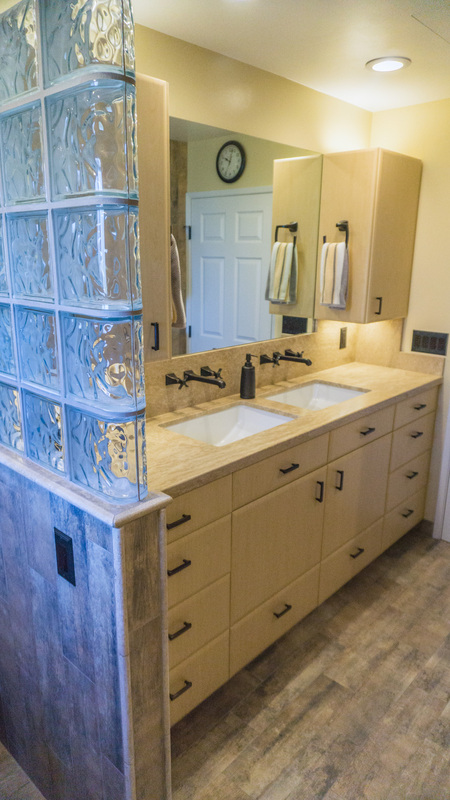 Taller bath counters, 39″ in this case, at clients request, for easy access to the sink and less splashing and bending over. 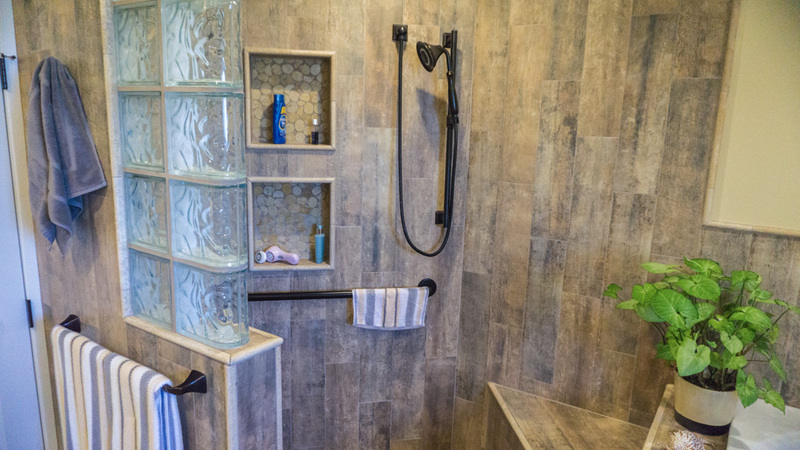 On demand heater on 1-hour timer switch to warm air prior to turning on shower, so air will hold more moisture longer, allowing the vent time to evacuate damp air before air becomes super saturated and shed moisture on mirrors, cabinets, paint, etc. 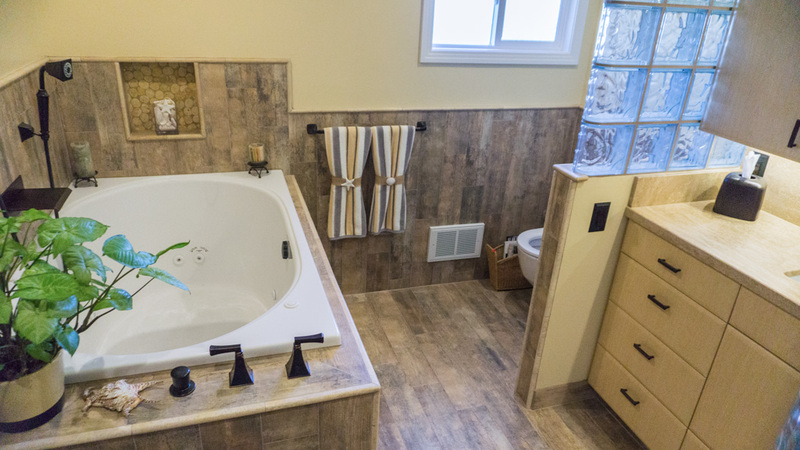 Ultra Quiet 110cfm Panasonic Vent on 1 hour timer switch. 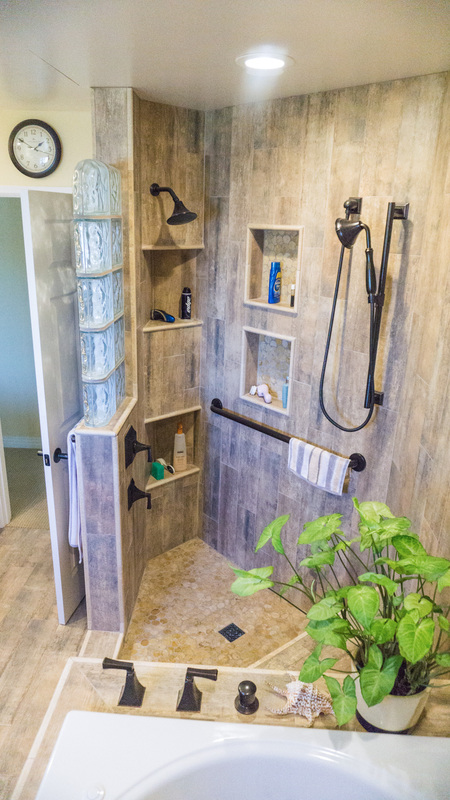 Walk-in shower, no doors. 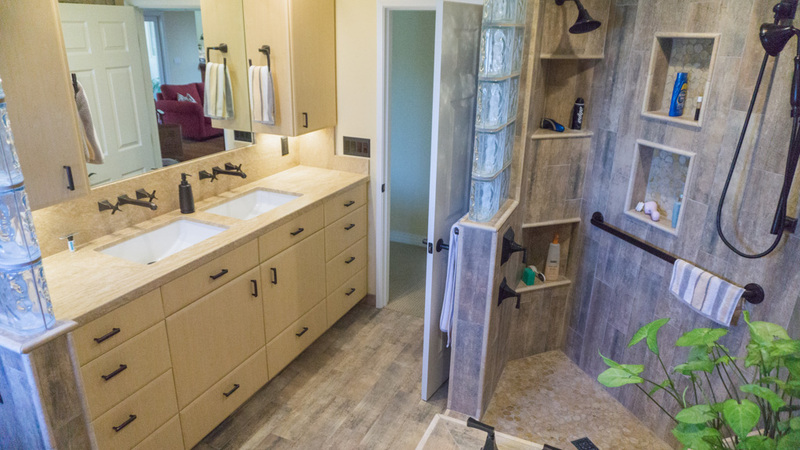 With seat, recessed shampoo shelves, grab bars, fixed shower head and hand held. 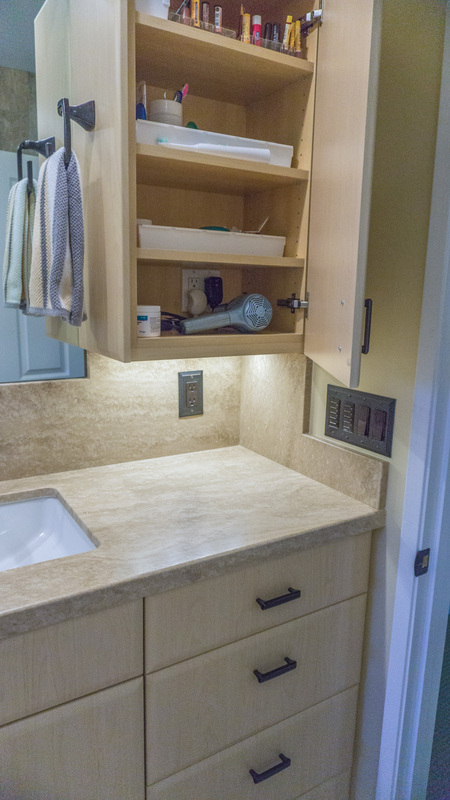 Efficient and high quality LED lighting recessed into the ceiling and indirect LED lighting above and below the cabinets. 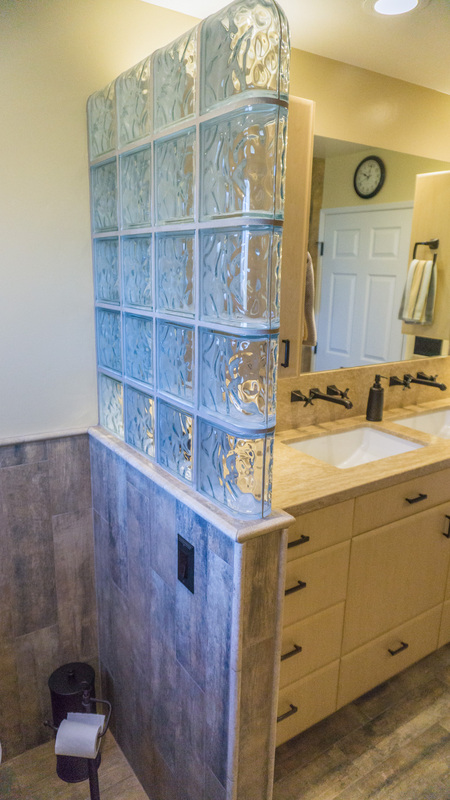 Glass blocks were installed as privacy partitions for the shower and toilet areas. 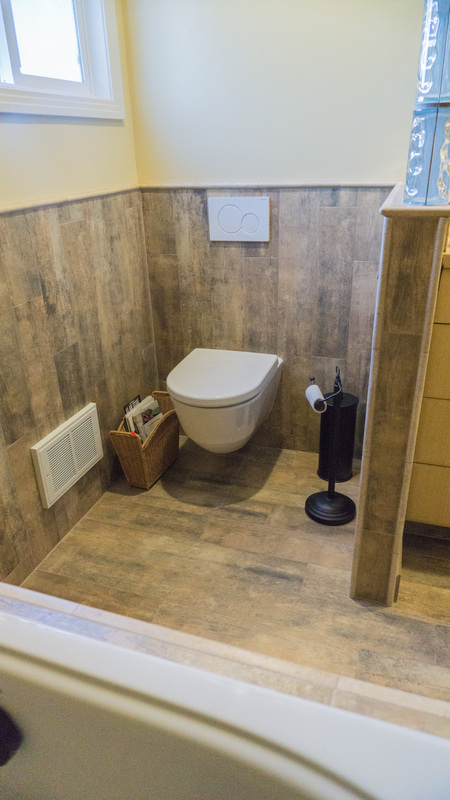 The toilet is a Wall Hung Geberit brand hidden tank toilet. 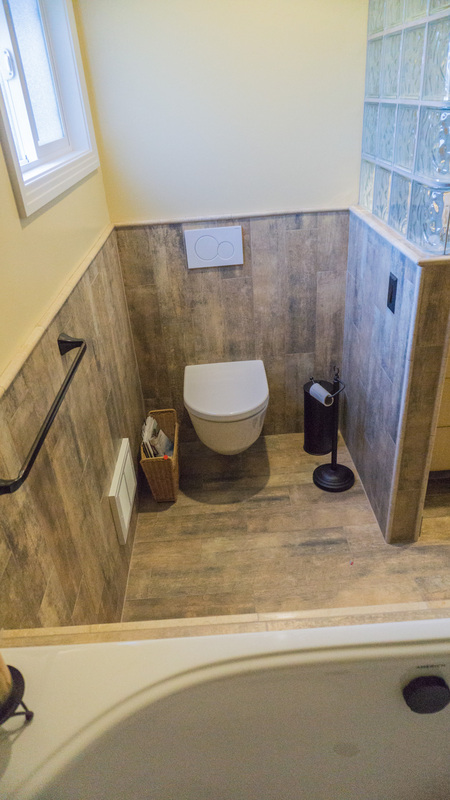 The toilet tank and moving parts are actually inside the wall. 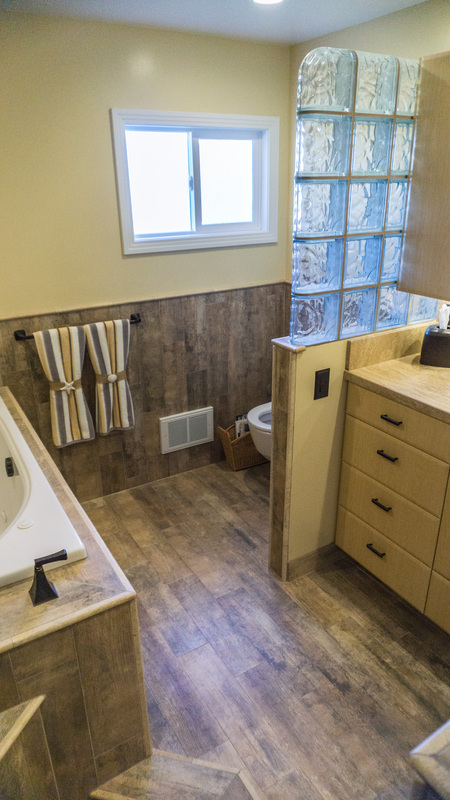 The wall plate above the toilet has two flush buttons, one for small flush, one for large flush. 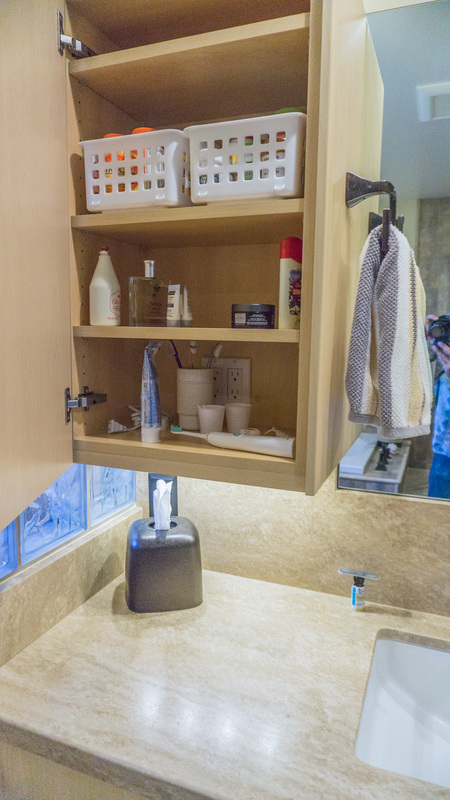 That plate is also removable for access to all the moving parts for the tank and repairs. 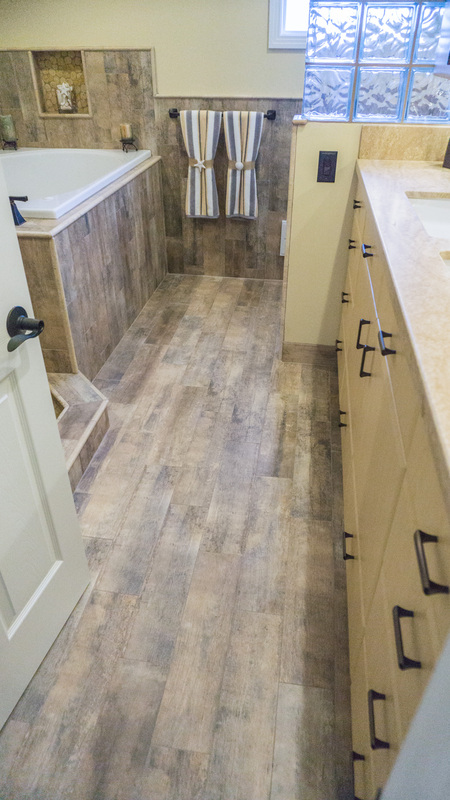 The clients loved the warmth of the darker porcelain plank tiles that mimic real wood used on the floors and walls. 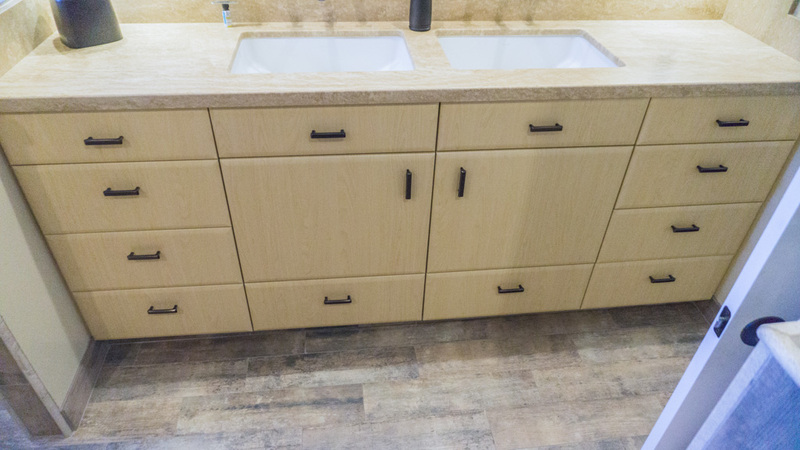 The cabinets look like natural maple, but are actually a thermofoil lookalike with soft clam shell shaped edges. 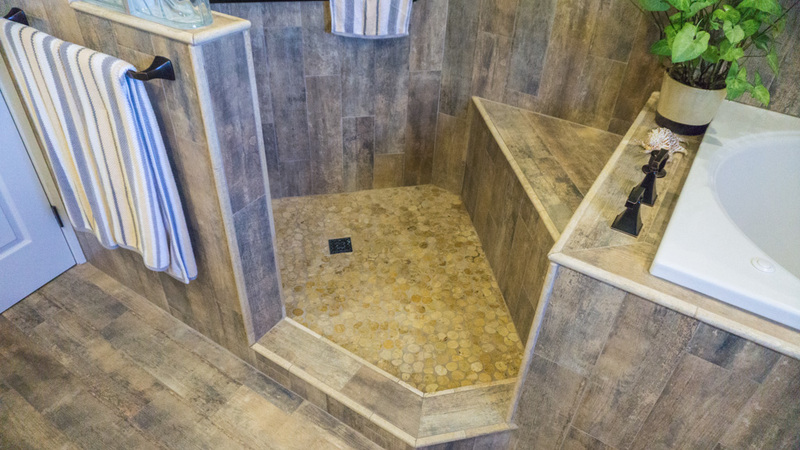 The tile work is trimmed out with real marble edge details compatible with both the tile and the flat marble stones used for the shower floor and shampoo recesses. 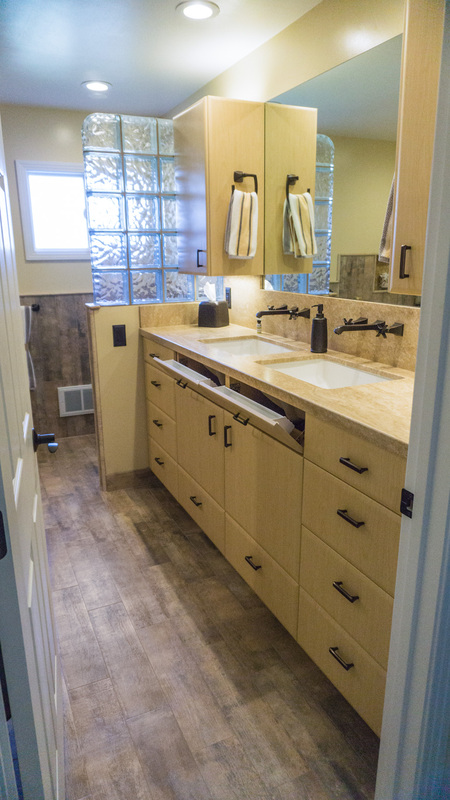 The warmth was continued with the natural stone marble countertop with full splash. 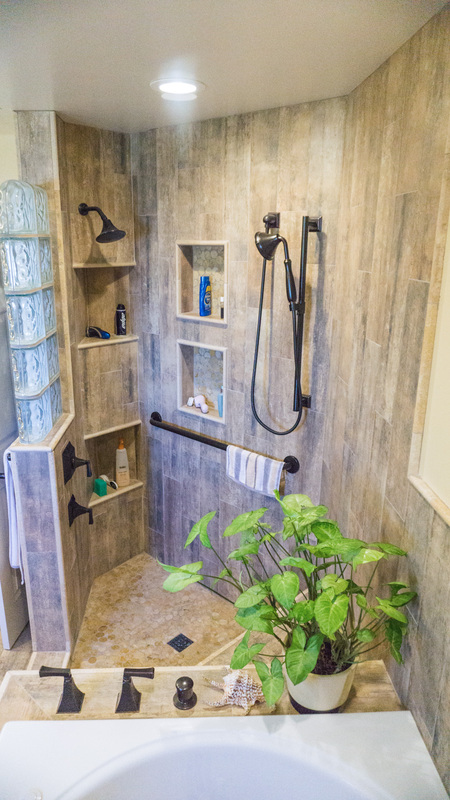 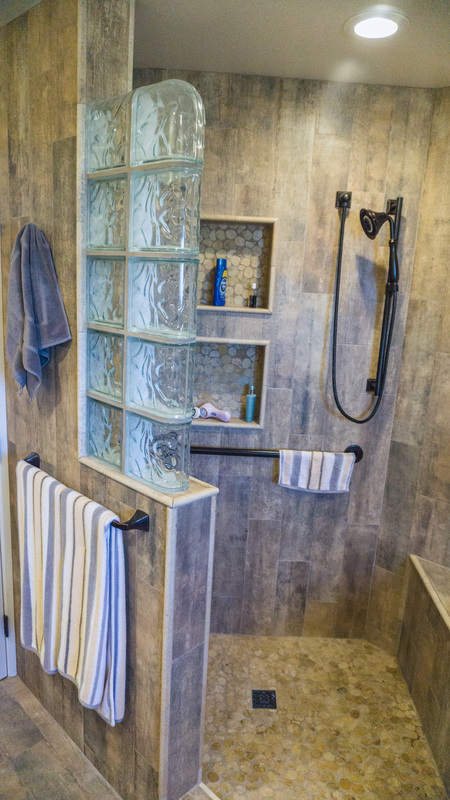 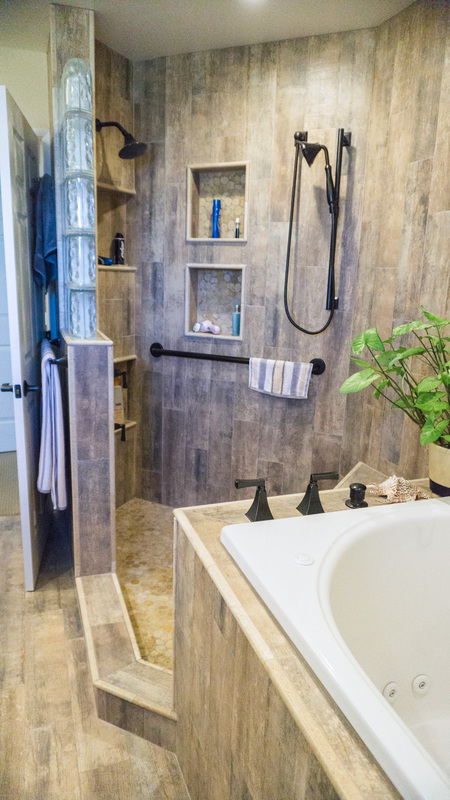 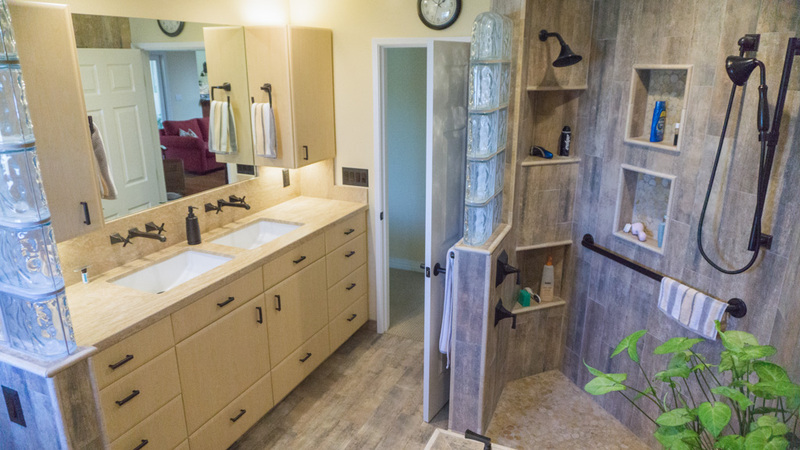 The large walk-in shower has no need for a door, a large seat, two shower heads, one fixed and one hand held, and numerous recessed shelves for storage. 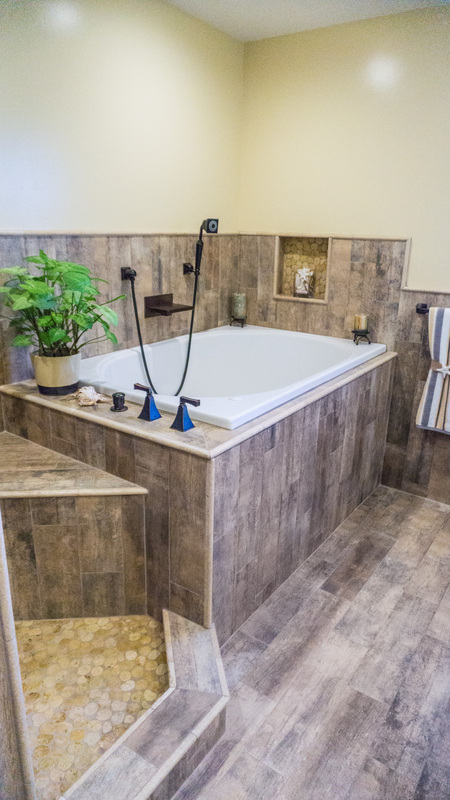 The 60 x 40 x 32″ deep soaking tub has seats for two, a wall-hung tub fill and also its own hand held wand spray. 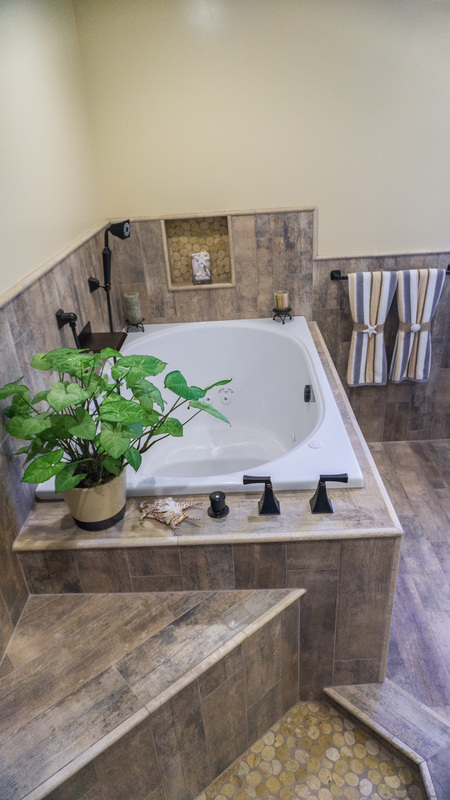 This tub is easy access because of its height. 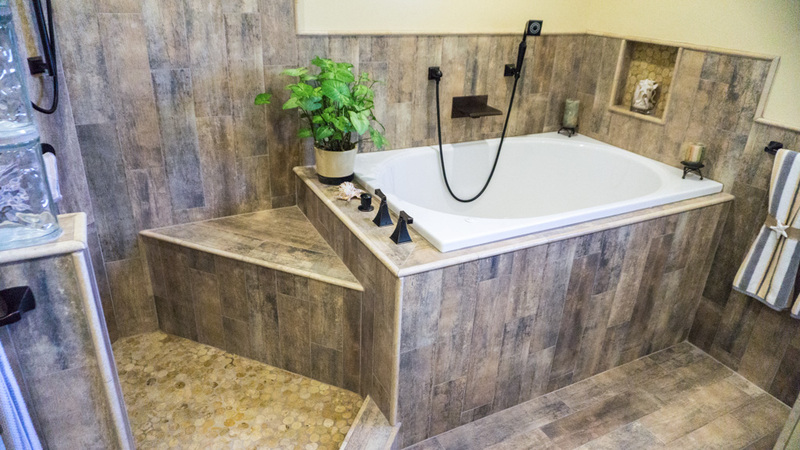 You just sit on the edge and swing your legs into the tub. 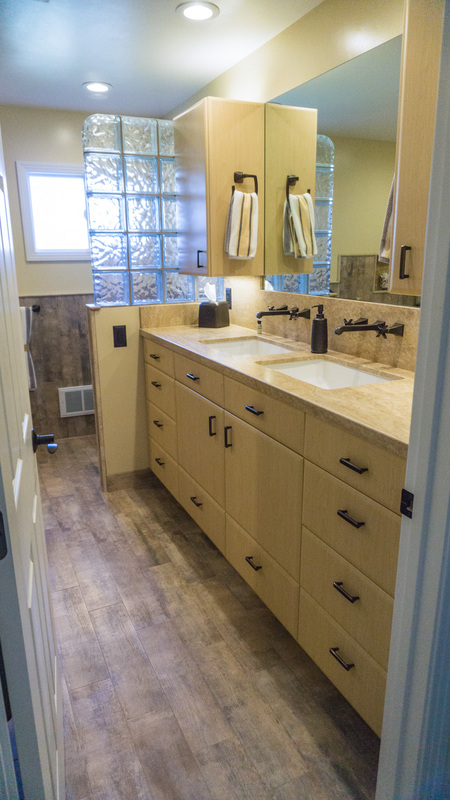 This client loves their new master bath.